I have long been a fan of LEDs. Even when I was a little kid, I can remember buying LED bulbs at Radio Shack and taping them to batteries to make little light-up projects. There's just something fascinating about a form of light that barely gets hot and uses so little power. Now that I'm a responsible adult, LEDs have taken on a new fascination for me. Since they are such a clean, cool, bright, and energy-efficient way generate light, I want to be able to use them to light my house. Up until recently, LEDs haven't been able to generate the same level of light as incandescent or florescent bulbs, or the ones that could were extremely expensive. But that's finally changing this year, with places like Amazon and Home Depot selling very inexpensive LED bulbs that are quite comparable to traditional bulbs in brightness. So, with these cheaper bulbs comes my official embarking on Project LED, my attempt to replace every single light source in my house with LEDs. I have purchased LED lights in the past that are supposed to replace traditional bulbs...and they've been disappointing. Now, however, there are some better options on the market. Amazon sells one by Pharox that is a 60-watt equivalent for only $27, while Home Depot has a 40-watt equivalent bulb by EcoSmart for $18. Assuming the bulb is on for 8 hours per day, a 40-watt traditional bulb costs about 4 cents per day to run, or $12.85 a year. The 40-watt LED from Home Depot costs 1 cent per day, or 2.76 per year. That would mean that at $18 each, these bulbs would pay for themselves in less than 2 years. 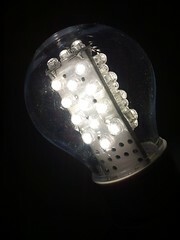 And with a lifespan of 50,000 hours, at 8 hours per day, this bulb would last almost 17 years. That means that the one I just bought could still be in use by our family when Amber is in college. Is that insane or what? Here's some more quick math. Our apartment has approx. 21 light bulbs, including the outdoor lights. If we were to replace them all with the $18 bulbs, it would cost $378 + tax. And it would cost $567 + tax to replace them all with the $27 bulbs. Those are some hefty amounts when looked at lumped together like that. Even if I could afford 500 bucks, I have more pressing things to spend it on than light bulbs. That's why this will be a gradual process. Someday, hopefully soon, I hope to be able to say that every light in our house is LED. Between the bulbs I just discussed, LED florescent replacements , LED light strips, etc. there are LED options for almost every application. They're not cheap by any means, but they consume so little electricity that they quickly pay for themselves. Lighting accounts for 10-20% of the average house's electric bill, so it's easy to see how even replacing a few bulbs with LEDs could show a noticeable drop in power use.